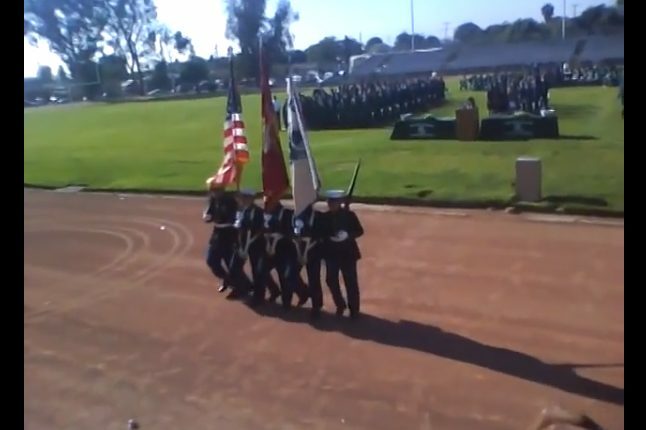 Screenshot of a 2011 MCJROTC presentation of colors during a game at El Rancho High School. Gregory Salcido, a teacher at El Rancho High School in Pico Rivera, California, attempted to bully two members of his US. Government class because they were wearing a Marine Corps sweater and sweatshirt. We spoke to one of them on Saturday, Jan 27, to find out what transpired. The videos were recorded on January 19. We are not using the student’s name in case of repercussions from either the school or the teacher. The young man wearing one of the items tried to be careful about letting the teacher see what he was wearing after the rants started, but he had to turn in a paper. The teacher saw it saw it and the ranting got worse. Salcido began berating the student in front of the class, using expletives to describe his opinion of the military. Students in the background laughed. Is he trying to cause his students to commit suicide over their life choices? “I don’t understand why they let these friggin military recruiters come into this school. We don’t let pimps come into the school. They’re just going to lie to you…” He even compared recruiters to whores. The student told us that this particular teacher has run down students’ religion as well, but nobody complained about it. The student we spoke to comes from a Marine Corps family, and his desire is to join the Corps like his Dad, brothers, and uncles. He switched out of the liberal teacher’s class so that he could complete his high school requirements for graduation in relative peace. It is this young man’s right to follow the career path he choses, without the intimidation of opinionated lefist teachers like Gregory Salcido. For information, Salcido was once placed on administrative leave in May 2012 for smacking the back of a student’s head and demanding that he get the **** out of his class. He was also under scrutiny for racial remarks in 2010. Bullying, berating students for any reason is unacceptable. The original Facebook post about the rants includes emails for the El Rancho Unified School board. El Rancho High School once had a Marine Corps Junior ROTC program (MCJROTC). The last post on their facebook page was 2012.